Will be included in patch 2.6.0. 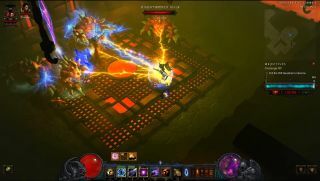 Last year, Blizzard announced that Challenge Rifts—a new version of the randomised Greater Rift dungeons—would arrive sometime this year, and now we've finally been given a "first look" at the upcoming feature, both in a new blog post and in a YouTube video, below. And, you know what, they sound pretty fun: a way to experience other character builds, without having to restart from level 1 and cultivate a new class yourself. As the Blizzard blog post explains, "Challenge Rifts are a weekly static version of a previously completed Greater Rift. To create a Challenge Rift, we pull a Greater Rift run directly from a player’s account. Once we have that snapshot, we make that exact character, including their items, paragon levels, skills, and gear available for everyone to play. "This also includes an exact copy of the Greater Rift they completed with that character. Enemies, pylons, and the dungeons you encounter will all be exactly as they appeared when the original player completed their run. If you beat the original runner’s time, you’ll be rewarded with a weekly satchel filled with bounty and crafting materials and some Blood Shards." The Challenge Rifts will rotate every Monday, so, when you put it all together, they sound a bit like Spelunky's Daily Challenge Mode, only weekly and with a time trial element bolted on. In other words, they sound like a lot of fun, while that de-emphasis on randomisation could have a revitalising effect on the way people generally play the game. "Builds are selected from live players," Blizzard elaborates, "so you might get something totally different than the builds you’re used to seeing on fansites or your favorite streamer’s channel. A build from the start of a Season might be a mix of the first Legendaries someone happened to find, and you may need to capitalize on the effects of items or abilities you’re not used to using. Regardless of how the build came together, it’s the same set of tools every player in the Challenge Rift will be using—this puts every player on a level playing field, so you’ll play alongside the best in the world no matter your experience!"